UFC Fight Night 115 emanated today (Sat., September 2, 2017) from Ahoy Rotterdam in Rotterdam, Netherlands. The show was headlined by a pair of uber-tall big men, as Stefan “The Skyscraper” Struve battled Alexander Volkov. In addition to the main event, it also turned into the Fight of the Night. Both Struve and Volkov banked an extra $50,000 for their slugfest. Though it was a foul-laden affair with multiple eye pokes, particularly from Struve, the two heavyweights tore into each other for every other moment of the bout. A flying knee opened a gnarly cut under Volkov’s eye and seemed to give him an extra sense of urgency. He countered that with a takedown and punishing ground and pound to end the first frame. “Drago” gradually took over to an increasing degree as the fight deepened, snapping Struve’s head back with punches and chewing up his legs and body with kicks. Visibly slowing down, Struve had a harder and harder time maintaining distance and finding the mark on his own shots. Volkov put the nail in the coffin in the third when a final barrage against the fence forced Struve to his seat, prompting the referee to intervene on the Dutchman’s behalf. 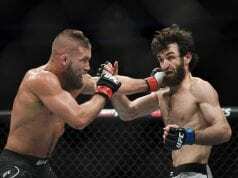 Two undercard fighters took home matching Performance of the Night bonuses, as Zabit Magomedsharipov and Mairbek Taisumov stopped their foes in impressive fashion. Blue-chipper Magomedsharipov took on the game Mike Santiago, stepping in on short notice just two weeks after fighting on Dana White’s Tuesday Night Contenders Series. Zabit’s flashy and dangerous striking and counter-wrestling game proved too much for Santiago, who hung tough but ultimately submitted to a second-round rear-naked choke. Taisumov was equally impressive, one-shotting formerly undefeated Felipe Silva with a counter right hand. As Silva pressed forward aggressively, Taisumov ducked under a left hand and landed a short overhand right on the button. Silva face-planted, looking up in a dazed state from the canvas. Taisumov calmly walked off as the referee jumped in to save Silva from unnecessary punishment. Keep it locked to LowKickMMA for all your UFC Rotterdam post-fight coverage.